Evangelion: 1.0 You Are (Not) Alone: Shinji Ikari is sent for by his estranged father, Gendo at the beginning of the film. As he wanders around the town, which has been shut down over an emergency announcement, he is caught in the crossfire between the U.N. army and the fourth Angel. Rescued by Lt. Colonel Misato Katsuragi, Shinji is brought to Tokyo-3 and NERV headquarters, where he is pressured by Gendo, NERV's Supreme Commander, into piloting the Evangelion Unit-01 against the Angel because the other Evangelion pilot, the mysterious Rei Ayanami, is too injured to do so. After the initial fight, Shinji is taken in by Misato as her new housemate and enrolled in middle school. The film portrays Shinji's attempts to ""settle in"" with his newfound life alongside Misato, Rei, and the other characters while continuing to defend Tokyo-3 and the world from the coming Angels. At the film's climax, the fifth Angel tries to drill into NERV headquarters. To motivate the despondent Shinji, Misato takes him down to the deepest level of the base and shows him a giant white entity crucified to a giant cross-like restraint: the second Angel, Lilith. Misato explains that reaching this area is the goal of the Angels and that any contact between them and Lilith would bring about the end of all life on Earth. With this information and the encouragement from his new friends in school, Shinji and Rei, piloting Unit-00, attempt to kill the Angel by sniping it using the Evangelions and an experimental positron rifle, which requires the entire electrical power output of Japan to function. Rei is nearly killed in the battle, though Shinji is able to save her by prying her out of her damaged Eva using Unit 01's Progressive Knife. Shinji and the normally cold Rei share an emotional moment and Rei eventually shares a warm smile with him. The final scene opens on the surface of the Moon, with what appears to be blood splashed across a large swath of it. Nine coffin-like containers are arranged in a line on the surface, with five of them open. Kaworu Nagisa awakens and rises from the fifth container. In front of him is an unidentified white giant, surrounded by construction equipment and scaffolding, wearing a purple Seele mask. Kaworu engages in a brief, cryptic conversation with the Seele 01 monolith, saying that ""the third one"" has not changed at all and that he looks forward to meeting Shinji. 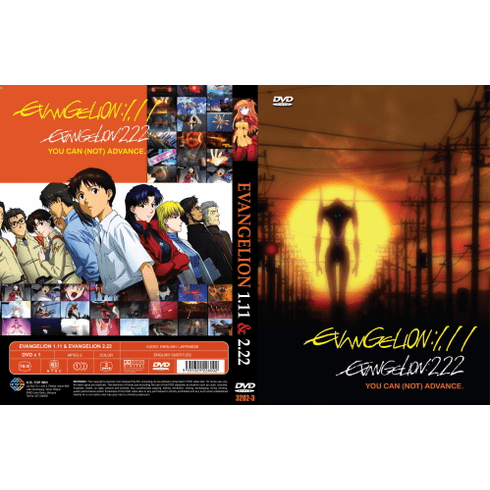 Evangelion: 2.22 You Can [Not] Advance: The landmark anime Evangelion evolves, reaching new heights of intensity in the feature film: Evangelion 2.22. In this explosive new story, brutal action and primal emotion clash as a group of young pilots maneuver their towering cyborg Eva Units into combat against a deadly and disturbing enemy. In the battle to prevent the apocalyptic Third Impact, Shinji and Rei were forced to carry humanity's hopes on their shoulders. Now, as the onslaught of the bizarre, monstrous Angels escalates, they find their burden shared by two new Eva pilots, the fiery Asuka and the mysterious Mari. In this thrilling experience for fans of giant robot destruction, the young pilots fight desperately to save mankind - and struggle to save themselves.